The Harriet Beecher Stowe house is located at 2950 Gilbert Ave. in Walnut Hills. The 5,000 square-foot house was completed in 1833. 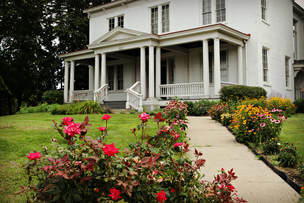 It is an historic house museum and cultural site focused on Stowe, author of Uncle Tom’s Cabin. The house itself reveals a rich history of 185 years of social activism and African-American history. The Cincinnati Park Board maintains the adjoining grounds. The museum has been part of the Ohio History Connection network, formerly the Ohio Historical Society, a statewide organization with the mission to spark discovery of Ohio’s stories, since 1949. Chartered as a 501©(3) nonprofit organization, OHC carries out history services, including the official state archive, local history office and manages more than museums and 50 sites, e.g., the Rankin House in Ripley, Ohio and Ft. Ancient. The white painted brick, thirteen room house has seen better days with cracks in the walls and crumbling wallpaper, but changes are in the offing. Decoration is in a state of flux, according to Christina Hartlieb, site manager. OHC members plan to renovate the house to be more consistent with the period of the 1830’s. Now, the house is furnished with a mixture of furniture styles, antiques and a wide variety of wallpapers. Plans are for renovation to begin in early 2018 and conclude within three years. The house contains many interesting furnishings, but none are original to the time Beecher Stowe lived there. In her father Rev. Lyman Beecher’s study, there is a desk that came from Lane Theological Seminary originally located nearby. The parlor has a reproduction of Beecher Stowe’s portrait painted by Alanson Fisher in 1853. The original is in the National Portrait Gallery at the Smithsonian Institution in Washington, D.C. Rev. Beecher lived in the house for twenty years. There is exposed brick of the first fireplace and beehive oven in the original kitchen. As part of the restoration process, this room is planned to become an 1830’s kitchen. Upstairs in the bedrooms, a visitor can see wood framing for the doorways that once led between rooms. The oak wood flooring throughout the downstairs was laid in 1908, the same year that the grand staircase and wood paneled room (now the bookstore) were added. The Monforts, who owned the house for years, added three rooms and a kitchen due to the expansion of the family, also in 1908. Today, these rooms function as a staircase, a bookstore and a modern kitchen. Workers added several fireplace inserts and flooring during the renovation. Students at the seminary assisted in the Lane building project as part of the program of manual labor required by the institution. The Kemper family provided some of the bricks. The nearby seminary, no longer in existence, was home to controversial debates over slavery. Established in 1829, it focused on Presbyterianism. The site also centers on relatives and friends of the Beecher Stowe family and Lane Seminary, as well as the Underground Railroad, civil and human rights. There are cultural events, programs and tours. Available are a lecture series and a fall book discussion group centering on Uncle Tom’s Cabin led by John Getz, Ph.D., professor emeritus, English Department, Xavier University. Upcoming dates of the series are 10/18, 11/15 and 12/13 at 7 p.m. The group is co-sponsored by the Xavier Center for Faith and Justice. The Semi-Colon Club meets at noon on October 28 featuring Remember Me to Miss Louisa by Sharony Green. The Hattie and Eliza Stowe Education Center is now open. Named after Harriet’s twins born in September 1836, the center offers activities for children including fan making, stenciling, writing with a simulated quill and ink, and 19th century toys. The house is also available for rental for meetings and special events. Gamaliel Bailey, M.D., was a physician who taught biology at the seminary where Thomson MacConnell Cadillac now stands. He took over as editor of the Philanthropist, Cincinnati’s anti-slavery paper, after the press was torn apart by a pro-slavery mob and thrown into the Ohio River in 1836. Suffering the same indignity five years later, he moved to Washington to begin work on the National Era, where John Greenleaf Whittier assisted him. “My vocation is simply that of a painter, and my object will be to hold up, in the most lifelike and graphic manner possible, slavery…. which I have had ample opportunities for studying. There is no arguing with pictures, and everybody is impressed by them, whether they mean to be or not,” said Beecher Stowe. 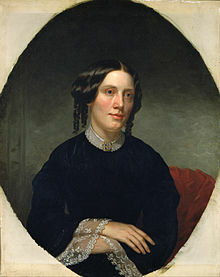 She wrote Uncle Tom’s Cabin in Brunswick, Maine, while her husband held a faculty position at Bowdoin College. Hartlieb said, “The Harriet Beecher Stowe House strives to extend the work begun in the 1830s in Cincinnati by Beecher Stowe and her contemporaries: to replace prejudice and greed with acceptance and kindness. Our mission is to preserve and sustain that legacy. We tell the story of Harriet and the eighteen years that she spent in Cincinnati as instrumental in developing her anti-slavery passion and enabling her to write Uncle Tom’s Cabin. In sharing the story of abolitionism, we are able to relate her words and deeds to social justice issues today. 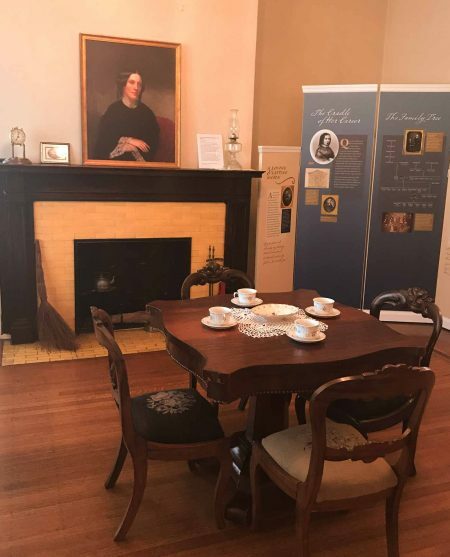 The Friends of the Harriet Beecher Stowe House, Inc. operate the facility open to the public. In 1970, the National Register of Historic Places sponsored by the National Park Service placed the building on its list. Lane appointed Calvin Stowe professor in 1832. In 1836, he married Harriet Beecher, daughter of Rev. Lyman Beecher. The family was active in religion, education, antislavery and women’s rights. Brother Rev. Henry Ward Beecher was a leader of the women’s suffrage movement. Catherine Beecher, Harriet’s sister, became a writer and teacher. Beecher Stowe lived in Cincinnati for eighteen years, and became an abolitionist here. She grew up in a religious community, a Presbyterian household. She was exposed to the free black community and visited plantations in Kentucky. Stowe became close friends with the John Rankins, who operated an Underground Railroad site in Ripley, Ohio. Rankin (1793 – 1896) was a Presbyterian minister. Although volunteers manage the property, Hartlieb is the first full-time paid director who joined the house in May 2017. Originally a teacher of high school history at St. Bernard-Elmwood High School, Hartlieb was looking for a new challenge. “I have always enjoyed visiting historic places,” said Hartlieb. “I focused on social history, women’s history and African-American studies.” Hartlieb has a B.A. from Hanover College in history and an M. A. in history from the University of Cincinnati. The house is open Friday, Saturday and Sunday from noon to 4 p.m. Guided tours are 12:15, 1:15, 2:15 and 3:15 p.m. Admission is $4 for adults; $2 for children ages 6 – 18. It is closed for regular admission December, January and February and closed all Federal holidays. Call (513) 751-0651 for more information.